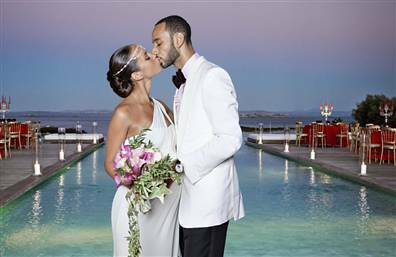 Alicia Keys has officially wed Producer Swizz Beatz in front of family and friends in a private home on the Mediterranean Sea. According to sources, Alicia "wore an ivory silk, georgette-draped Vera Wang goddess gown with jewel detail on the back shoulder. While Swizz kept it handsome in a classic Tom Ford tuxedo. Congrats on a hopeful happy ending!